There are few things more important in life than your wedding day. It’s the day you get to do exactly what you and yours want—to have the ceremony and reception of your dreams. Often times, though, our dreams take a fair amount of planning to achieve, and if your dreams also involve a specific locale, it can be an extra stressful endeavor. Some brides and grooms know right away they want a destination wedding—maybe because they found a great wedding package to go along with the area they’ve been dying to vacation/honeymoon in, or maybe because it just fit their budget better than traditional options. If you’re still trying to decide on a destination wedding, though, we’ve listed some advantages and disadvantages below for you to consider. Just remember to keep this in mind: all things are easier to achieve with the help of a professional wedding planner. If at any point you feel overwhelmed—destination wedding or not—remember that a wedding planner’s sole purpose is to take that feeling away so you can ENJOY not just the wedding but everything leading up to it! You and your significant other’s families are far away from each other—if your fiancée is from Texas, you’re from Michigan, you might want to get married in a neutral location. Whether it’s tropical Cancun or a charming town in Tennessee, it places the focus solely on your wedding instead of whose state gets the honor of the wedding! You love the idea of a vacation and a wedding rolled into one—Maybe this should be reason #1, because it is pretty fantastic. Imagine the most romantic city or the most exotic beach you’ve always wanted to visit—or that you’ve been before and want to experience again—how much better would it be to get married there and then experience your honeymoon immediately afterward? Your guests will also always remember the day, because it will be a new experience for them as well. A smaller wedding sounds more appealing to you—if you and your significant other don’t want to invite cousins twice removed or your parents’ work colleagues, a great way to cut down on guests is by having a destination wedding. Only your closest friends and family will wish to make the trip because it will cost more and take more than one night. Wedding guests who come mostly for the free food and drinking will be deterred and you can be assured those who make the trip are there because they can’t wait to see you get married! Another bonus: you and your S.O. will more time to spend with those who made the trip rather than trying to get a minute with more than 100+ guests. It will really create special memories! Saving money is a priority—destination weddings can be less expensive than traditional weddings, but it really depends on whether your chosen location or resort has wedding packages. It’s not always a given, but if it’s your priority, you’re bound to find a location that fits the bill. If your budget is more generous, though, we seriously suggest a wedding planner who knows the area and who can achieve your vision. For those forgoing the wedding package route in lieu of a more personalized wedding, a wedding planner is a must! Make sure it’s legal!—If you’re getting married in another country, make sure you cross your T’s and dot your I’s! What’s considered a legal marriage on some tropical island may not constitute a legal marriage in the U.S. You might have to plan some separate time and paperwork before or after your destination wedding to actually make it legal where it really counts—home! Your or your wedding planner must research the location ahead of time. Guests’ finances—although destination weddings can save the bride and groom money, that’s not the case for the guests. While it’s true many guests who you wouldn’t miss very much won’t make the trip, there will always be those who can’t make it because of health or financial reasons that you will actually miss very much. You have to ask yourself if you’re okay with Grandma not being there because her age and health don’t allow her to fly to Tahiti; or maybe even one of your closest friends because the recession just hit her a bit harder than others. Keep in mind, though, you can always plan a party when you get home—while it’s against wedding etiquette to have a second “wedding,” having a party that celebrates your newlywed status is perfectly okay! Not having a wedding planner—if you’re dreaming of a Parisian affair but don’t know a lick of French or even a New Orleans masquerade without ever having set foot in the state of Louisiana, you’re in for some major stress planning! A wedding planner will already know who to talk to, where the best deals are, and which venue or caterer has those late-night crepes you insist on having. We really don’t advise planning a destination wedding without a professional! So mull over all these reasons and decisions and if your heart tells you to go for it, then you absolutely should! Destination weddings make for the most captivating, unique, and beautiful memories. Whether the destination is one hour away or an eight hour flight, you and your guests are in for the experience of a lifetime. 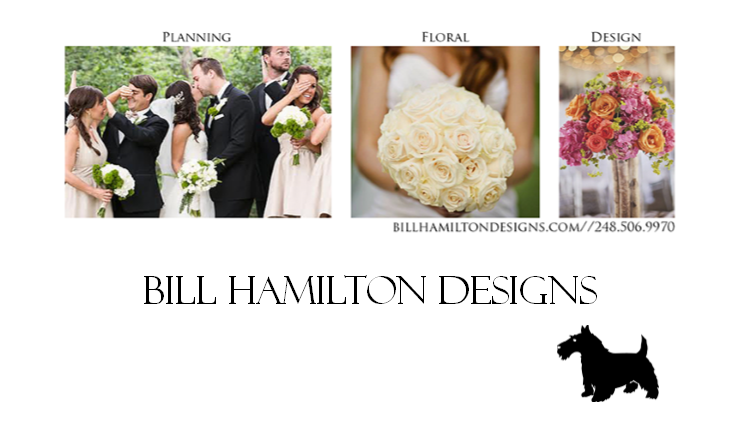 If you have any questions about a destination wedding, don’t hesitate to call Bill Hamilton Designs! We LOVE planning DWs and can tell you all about beautiful destinations around the country and outside of it.